MP for far-right Svoboda party in hot water after physically forcing TV broadcaster to sign resignation form, posting video online. A far-right Ukrainian MP could face charges after assaulting a senior TV broadcaster and forcing him to sign a resignation letter due to his pro-Russian stance. Igor Miroshnichenko of the Svoboda party was joined by several other men as they burst into the Kiev office of Oleksandr Panteleymonov, who runs Ukraine's state TV company. The men - including Miroshnichenko himself - proceeded to shove Panteleymonov, and landed several blows before making him sign the document. The entire episode was filmed and posted online by the attackers, and Miroshnichenko has insisted he did nothing wrong, saying Panteleymonov "served Putin and Russian propaganda... at a time when Ukrainians were dying on the streets," according to the Guardian. Under Panteleymonov's tenure, the state-owned First Channel was accused of censorship and biased reporting during the rule of deposed, pro-Russian president Viktor Yanukovych, and many Ukrainians were angered at the channel's perceived pro-Russian coverage of the ongoing crisis. Astonishingly, Miroshnichenko is a member of the new parliamentary committee on freedom of speech. His role in the attack - seen at around 2:40 minutes in the video below - has been harshly condemned even by leading figures within the Ukrainian revolution. Ex-heavyweight boxing champion Vitali Klitschko, who helped lead the movement to oust Yanukovych, said the MP should be punished for what he termed an act of "savagery and lawlessness". "Ukrainians changed the power in the country because of lawlessness and lack of justice. This should not remain unpunished. All Svoboda MPs who resorted to force should vacate their seats," he added. Interior Minister Arsen Avakov took to Facebook to condemn the assault, and hinted at legal action. But the prospect of a lawsuit may be complicated by the fact that the prosecutor general is also a member of Svoboda. Tensions over the Crimean Peninsula appear to be reaching fever pitch, with pro-Russian militiamen seizing several Ukrainian military bases and detaining the head of the Ukrainian navy in Sevastopol. 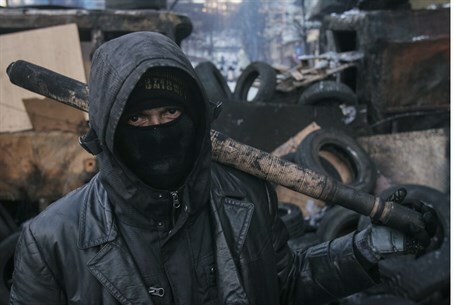 Despite representing a minority of the revolutionary movement to oust the former president, far-right and neo-Nazi factions played a key role in the violent clashes with police and government supporters which eventually forced him out of office. Concerns have been raised about the rise of the far-right in Ukraine and what that could mean for the country's more than 60,000 Jews, where anti-Semitism is already very high - although some Jewish leaders have rejected attempts by Russia to brand the interim authorities and their supporters as anti-Semites.